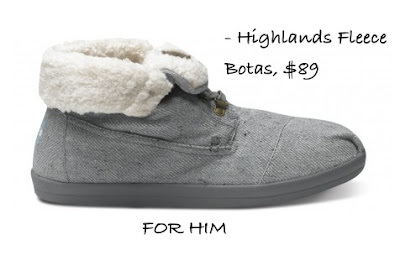 Toms Grey Calculus Men's Vegan Classics, $54. 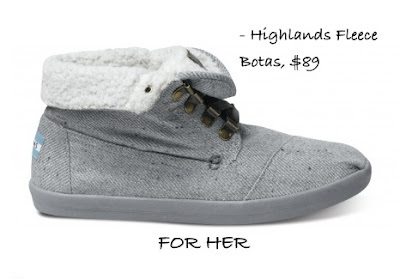 Toms Burlap Triangles Women's Classics, $54. In 2006, Blake Mycoskie created Toms Shoes and revolutionized the footwear industry. In fact, he wanted his business to be founded on giving and so he pioneered the One for One™ model. The One for One™ model is simple. For every item purchased from Toms, the company gives a new pair of shoes to a child in need. In places where children play, go to school and do their chores sometimes walking for miles barefoot, what Mycoskie started is no small feat. 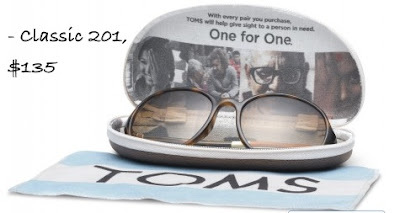 The first shoe drop was made in 2006 in Argentina with 10,000 shoes and since then Toms has provided over 1 million pairs to children all over the world. The product line which started with a classic shoe has expanded to clothing and modern eyewear. 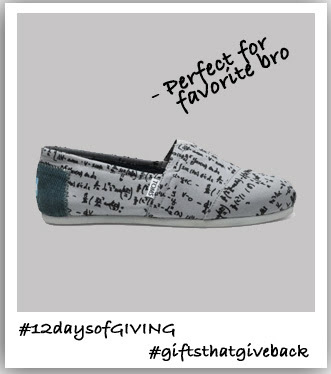 Toms products are über cool and can make the perfect #giftsthatgivesback for your stylish brother or sister. We could tell you but we'd rather show you! They have a ton of other styles to choose from.